For a moment, it felt like this was “the” season for the Miami Hurricanes. Yes, many considered head coach Mark Richt’s program a couple years ahead of schedule, and the media often questioned the legitimacy of UM’s wins. But when it came down to the numbers, no one could argue one fact: If Miami kept winning, it would have been selected into its first ever College Football Playoff. Even after the Canes suffered their first loss of the season in a shocking defeat to the Pittsburgh Panthers in their regular season finale, fans could attribute the upset to complacency, which often affects even the best teams. 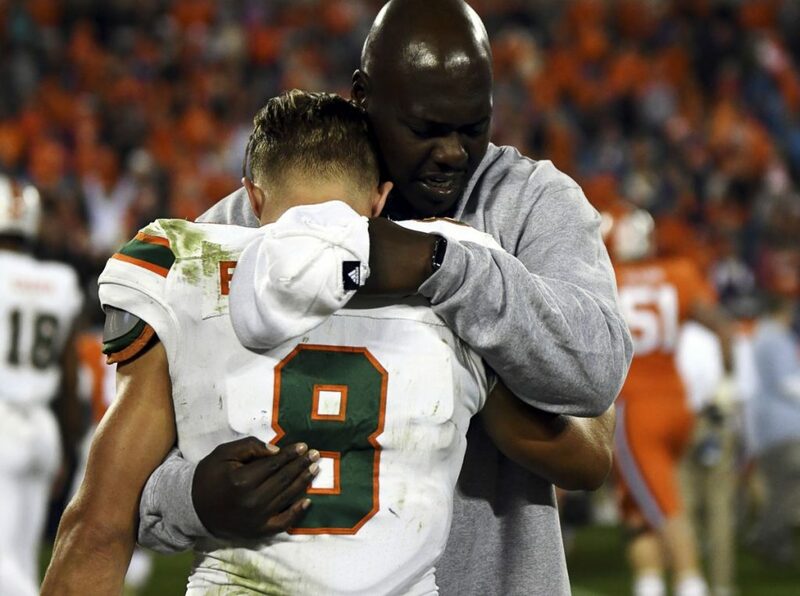 But in Miami’s heartbreaking 38-3 loss to the No. 1-ranked Clemson Tigers in the ACC Championship Game, no excuses could be made. The reigning national champions trounced Miami from start to finish, leaving Canes fans across the country asking the question: What just happened? Richt is right. The Hurricanes got a rude awakening. The Tigers were simply better in every aspect of the game. There is no doubt UM had a magical season, going undefeated through 10 games, reaching a national ranking as high as No. 2 and winning the Coastal Division for the first time in program history. Miami deserves a great deal of credit for the immense strides it has made over the past two years. However, there is no doubt that as special of a ride the 2017 season has been to this point, UM is simply not at a College Football Playoff level just yet. And for a team that has epitomized mediocrity for much of the last decade before Richt’s arrival, that is perfectly OK. In fact, it is normal in the process of what it takes to be a consistent national contender again. Despite the blowout loss, the future is bright for the Hurricanes. The No. 10 Canes are set to close out the season with their first appearance in the Orange Bowl since 2004, where they will look to end 2017 with a win against the No. 6 Wisconsin Badgers 8 p.m. Dec. 30 at Hard Rock Stadium. “Before the year started, if you said we’re going to play for the ACC Championship and get a chance to play in the Orange Bowl, I mean, we would not have been too happy about not winning the championship, but dang sure excited about the opportunity to play in the Orange Bowl, one of the classic bowl games in America,” Richt said. Against a Wisconsin team that holds a record of 12-1 on the season, Miami not only has a chance to win its first ever “New Year’s Six” game, but it also has an opportunity to regain momentum and national respect going into 2018. There are many good signs for Miami going forward. In two years, Richt has culminated 19 wins to just six losses as Miami’s head coach, and UM will return the majority of its starting lineup on both sides of the ball next year. The Hurricanes also hold a consensus top-five recruiting class for 2018, including verbal commitments from highly touted prospects Lorenzo Lingard, Brevin Jordan and Al Blades Jr.
UM continued its intense recruiting process fewer than 24 hours after the ACC Championship Game, in hopes of adding even more firepower to an already talented young core.